Northern white rhinos are probably the rarest of mammals at present. These magnificent creatures roamed freely in large parts of central Africa for hundreds of thousand years, but due to demand for rhino horn were recently poached to extinction in the wild. The signs of their presence in nature have not been seen since 2007 and there are only two specimens known to humans at present, both owned by the Dvůr Králové Zoo. This fact makes us one of the main institutions involved in efforts to save the northern white rhino (NWR). Who are these two last remaining individuals? Both females Najin and Fatu were born in our zoo in 1989, respectively in 2000. Both were transferred from our zoo to Ol Pejeta Conservancy in Kenya in 2009. 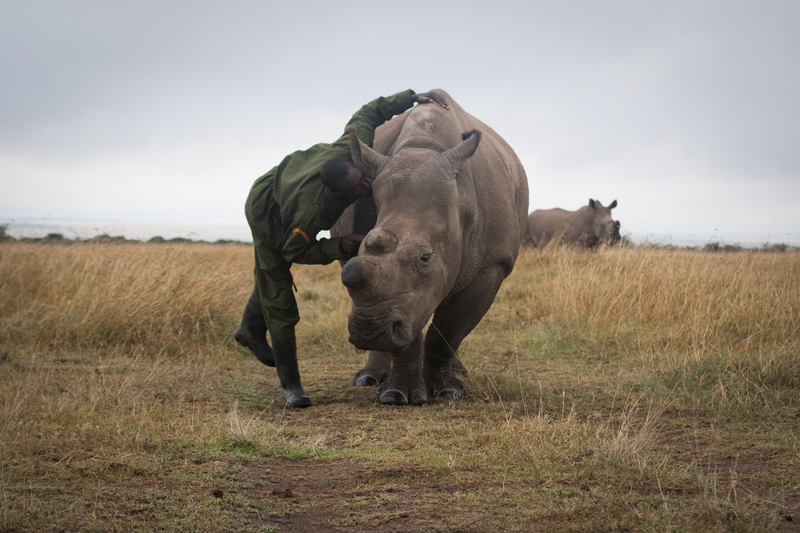 Ol Pejeta was chosen by experts from IUCN African Rhino Specialist Group as the best place where to try to save NWR by getting the last fertile animals from captivity together with the last animals from the wild. Unfortunately, the specimens from the wild have never arrived to Ol Pejeta. The response of the politicians and local leaders of DR Congo was so limp, that the NWR was poached to extinction in the wild before they were translocated. Thanks to our advanced breeding programme that started in the 1970s, Dvůr Králové Zoo is the only animal park in the world where the northern white rhino has been bred. However, it was back in 2000 when the last calf was born. So we turned to artificial techniques of reproduction. We have tried inserting a hormonal implant, we have even artificially inseminated NWR females, but no pregnancy from these techniques occurred. So in the hope that natural surroundings close to their original habitat may prompt their breeding we sent two NWR couples in 2009 to Ol Pejeta. Unfortunately, observed matings have not led to a pregnancy. Following the death of the last fertile northern white male in Ol Pejeta in October 2014, experts from our zoo together with experts of IZW Berlin, Ol Pejeta and Kenya Wildlife Service gathered in Kenya to carry out health checks on then remaining three rhinos. Examinations of the two females showed that neither is currently capable of natural reproduction. The only hope for NWR thus lies in artificial techniques of reproduction such as in vitro fertilization, embryo transfer or different forms of genetic engineering like a generation of stem cells that could be later used for generating reproductive cells. These techniques are known, but most of them have not been performed in rhinos.